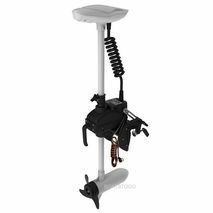 Electric Trolling Outboard Motor with Remote Control. 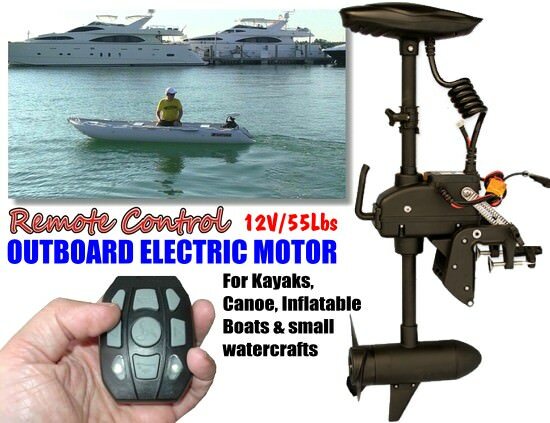 12V Electric Trolling Motor with FOB Remote Control that can be operated anywhere on a boat! Our new electric trolling motor now comes with portable remote control that allows operation of motor from a distance. Left, Right, Speed Forward and Stop can be all operated from portable FOB remote. Now you don't have to seat by the transom holding to motor tiller, but can be relaxing anywhere on your boat, even in a bow. Distributing operator weight in a middle of the	watercraft significantly improves its performance and speed. Instead of pushing water in front of it in an effort to go on a plane, now small boat can easily glide through the water, those improving not only speed, but also battery power consumption and duration of the ride. RC Electric motor uses 12V, with 50 Amp Max Draw. Battery Level reader built into controller housing displays accurate available battery power, and shows when battery need a recharging. 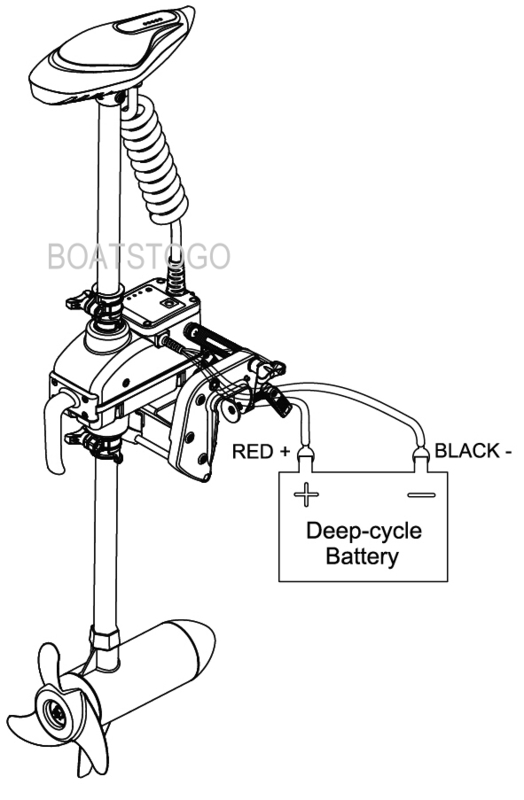 To operate this Trolling motor you will need 12 Volts "Deep Cycle"-type battery that sold in many retail, hardware or auto stores. You can get Deep Cycle battery in a Wall-Mart, K-Mart or Costco for about $55 and up. High-end Gel-Type Deep Cycle battery will run about $140. Portable and lightweight Lithium batteries start at about $300 and up. To charge battery you will also need Battery Charger, that will run about $30 to $60 epending on a brand and speed of charging. Motor Weight - 25 lbs. Overall Length - 37", Width - 18". Distance from transom mount to head - 17". 55 lbs power thrust, 12V, 50 Amp Max Draw. Adjustable Depth Collar - for changing the motor depth. Convenient handle for carrying motor around. Remote control allows operation from almost 100' away. Nine speed levels for optimal energy saving. Battery Reader - displays accurate battery level. Warranty - 1 Year from date of purchase. Quick Assembly of prop and tilt mechanism required. New remote control now comes with re-chargeable battery. IMPORTANT: Please download remote control charging instructions. Instructions how to build kayak motor mount. Download remote control reset button instructions. This motor model does not have a Reverse function. 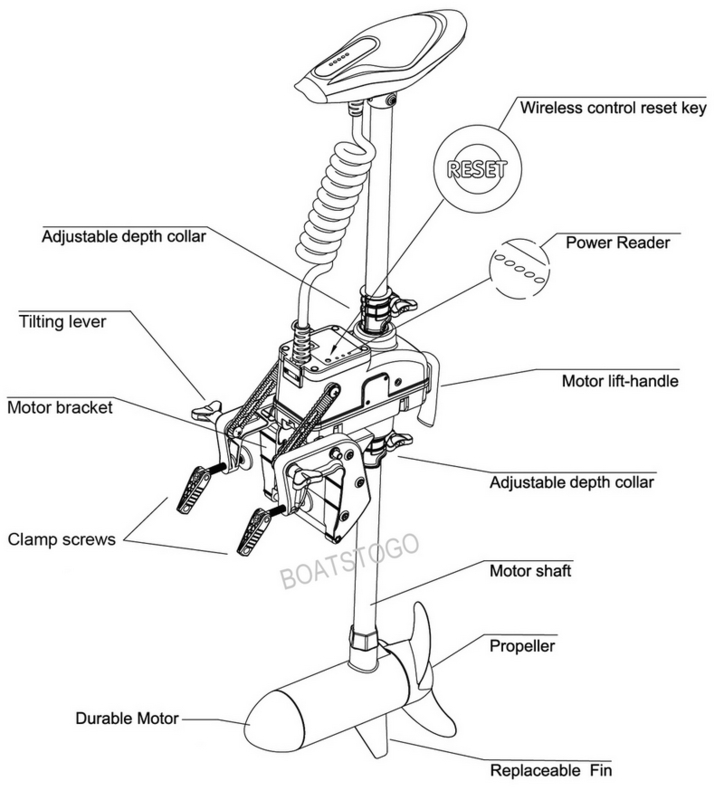 To ride in a reverse, motor need to be rotated 180 degree with a remote, or simply make 180 degree turn with a boat. To prevent motor jumping out of the water if it turned 180 degrees in a reverse, it is important that tilt level knobs are fully tightened on both sides, so that motor stays firmly in place. Click here for the assembly of tilt level mechanism. 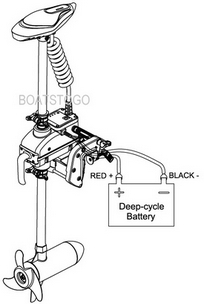 When changing directions, press left or right button toward direction of the desired turn, and once turn is complete, simply press opposite direction button to return motor into strait forward position to proceed with a set course, same way as you would normally do with a regular type of outboard motor. For example, if you want to make right turn, press right arrow number of times, and once turn is fully completed, press left arrow button same number of times to return motor into strait moving direction. We strongly recommend installing a $3 Quick Battery Disconnect in order to be able to easily turn off power to the motor in a situation that wireless connection between FOB and motor is suddenly lost due to low remote battery, radio interference or malfunctioning remote, while you are under way. 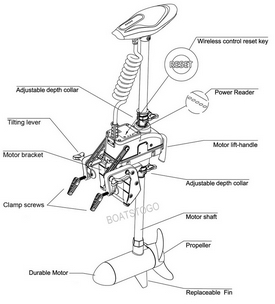 In this	situation you can easily disconnect power to the motor to kill the engine and take over your vessel with alternative means of propulsion, such as oars for example.